The Roman province of Epirus has so far not been at the centre of interest in archaeology, although numerous research projects have been carried out in recent decades on its archaeological sites. For the first time, this paper offers a comprehensive compilation. The thesis is that the areas of the province were by no means desolate or backward, as ancient sources claim. Against the background of the question of how to present a province in the east of the Roman Empire today and bring together the disparate research results, the concept of Romanisation must first be fundamentally analysed. As a concept developed for written sources, it proves to be unsuitable for application to archaeological sources, to material culture. 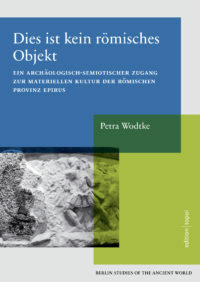 Therefore, this book develops a new archaeological-semiotic analysis system based on the theories of Charles S. Peirce, which focuses on questions of pluralistic communication structures and strategies. With the help of the new system, the archaeological research results from Epirus will then be evaluated. In addition to urban centres such as Butrint, Phoinike, Hadrianopolis in present-day Albania or Nikopolis and Dodona in Greece, rural settlement structures as well as issues such as road systems or water management are dealt with.